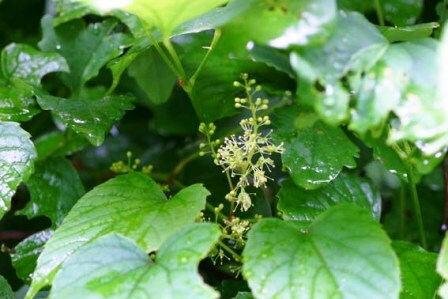 Himalayan wild grape (numerous common names) grows in Himalayan region from Pakistan, India, Nepal and then also in Western and Central China. 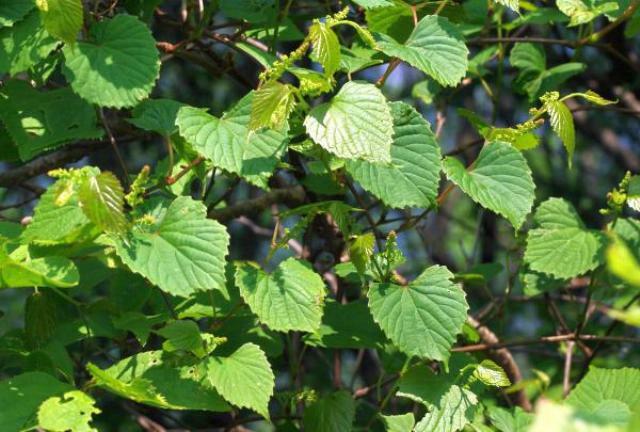 This is a deciduous climber that may ascend to a height of about 5 metres. It is fond in subtropical parts of Nepal. A deciduous trailing climber, branchlets terete, with longitudinal ridges, with sparse arachnoid tomentum when young, becoming glabrescent; tendrils bifurcate. 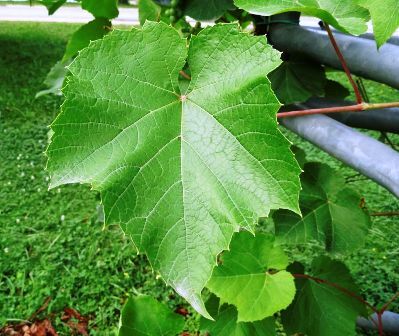 Leaves simple; stipules caducous; petiole 1.5-7 cm, with sparse arachnoid tomentum or subglabrate; leaf blade ovate, triangular-ovate, oval, or ovate-elliptic, 2.5-12 × 2.3-10 cm, abaxially with sparse arachnoid tomentum when young, eventually glabrescent, basal veins 5, lateral veins 4 or 5 pairs, veinlets inconspicuous, base slightly subcordate or subtruncate, rarely cordate, often asymmetrical, leaves with cordate bases with obtusely angled notch, margin with 5-12 slightly irregular teeth on each side, apex acute or acuminate; panicle leaf-opposed, loose, 4-12 cm, basal branches well developed, or short and slender; peduncle 2-5 cm, with sparse arachnoid tomentum or nearly glabrescent. Pedicel 1.1-2.5 mm, glabrous. Buds obovoid, 2-3 mm, apex rounded and subtruncate; calyx glabrous, undulately lobed; filaments filiform, 0.7-1.3 mm; anthers yellow, oval, 0.4-0.6 mm; pistil abortive in male flowers; ovary oval; style short. Berry globose, 8-10 mm in diam. Seeds obovoid, apex subrounded, chalazal knot elliptic, raphe slightly raised and surface smooth, ventral holes furrowed upward 1/4 from base. The fruits are very sweet and have a delicate flavour too. These are widely eaten by local people. These are also sold at some places. 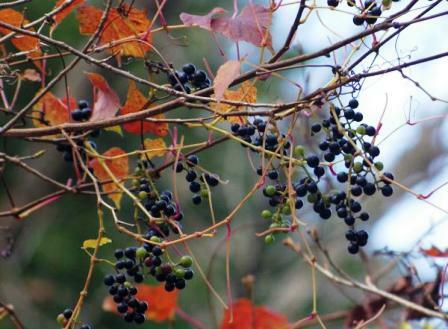 The fruits of Himalayan wild grape are collected from wild everywhere. This fruit has still not brought under cultivation.